Can confirm that since Legion these are at least not garanteed to drop, if they still drop at all. Toon in leveling (100~110), won a bg, opened the chest and only got some ilvl 720 item in it, no mark of honor. 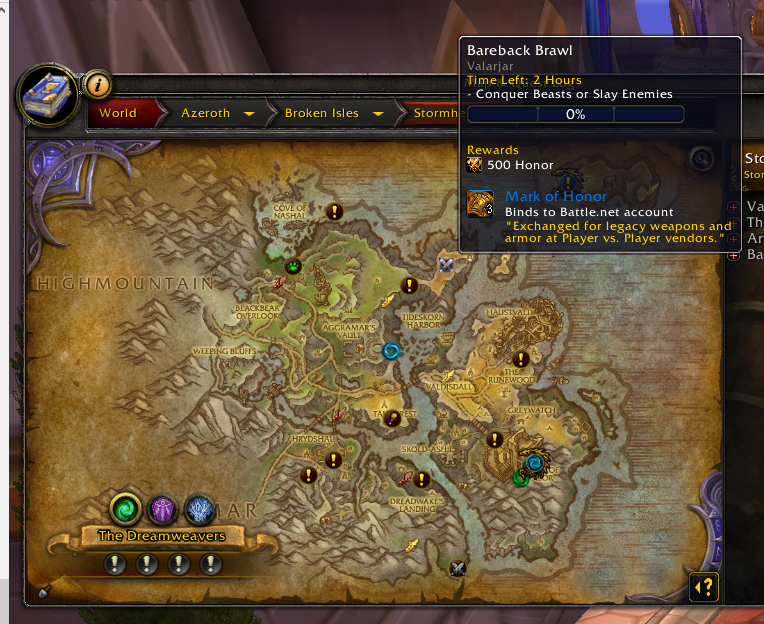 Can't say for 110 toons yet. 80 Weapon Arsenal for a specific season (example: Arsenal : armes du combattant primordial) - this teaches you all weapon appearances from that specific season, even ones your class cannot equip! One way to obtain these is from battlegrounds. It is found inside the Coffre renforcé du champion, from winning an unrated BG at level 110). The level 109 and lower version, Caisse de butin de guerre touchée par la corruption (obtained from winning a BG at these levels or from some Ashran quests) also contains these. I have ran roughly 30-40 skirmishes and won about 90% of them and have not received one Marque d'honneur out of a steel strongbox Coffre renforcé en acier so idk if this is a error or just a low drop chance. total 28 Marque d'honneur for starting DH - without neck, rings and trinkets. For anyone looking to farm these, the up to level 100 Caisse de butin de guerre touchée par la corruption seem to have a much higher chance to drop than the 110 equivalent. Haven't tested on anything else, but I've gotten significantly more from the Fel-Touched Crates. Can definitely confirm this still drops from Caisse de butin de guerre touchée par la corruption as of 12/18/2016 for sub 110 random battlegrounds. I got one today while spamming bg ques. Ensembles are available at various vendors for 12 Marque d'honneur each, and include appearances for 7 to 8 slots: chest, feet, hands, head, legs, shoulder, waist, wrist and (sometimes) back. Cloaks are also available for most PvP sets for 1 Marque d'honneur each; most ensemble items will not include the cloak slot for appearances however. (2) Some armor pieces from this set drop from Emalon le Guetteur d'orage in Caveau d’Archavon. (4) Some armor pieces from this set drop from Archavon le Gardien des pierres in Caveau d’Archavon. (5) Some armor pieces from this set are available for gold from Magistrice Vesara (Horde) - Northrend Dalaran, 65.6, 23.2, Arcaniste Miluria (Alliance) - Northrend Dalaran, 38.6, 53.6, Magistrice Iruvia (Horde) - Argent Tournament Grounds, Icecrown, 75.2, 22 and Arcaniste Asarina (Alliance) - Argent Tournament Grounds, Icecrown, 75.2, 21.6. In addition, some pieces drop from Koralon le Veilleur des flammes in Caveau d’Archavon. (6) Some armor pieces from this set are available for gold from Magistère Arlan (Horde) - Northrend Dalaran, 65.6, 23.6, Arcaniste Uovril (Alliance) - Northrend Dalaran, 38.2, 54.8, and Goodman « Tope-la ! » (Both Factions) - The Lower Citadel, Icecrown Citadel, 36.6, 20.6. In addition, some pieces drop from Toravon la Sentinelle de glace in Caveau d’Archavon. (7) In addition to the ensemble/individual vendor items, the Dreadful armor is also available as Crafted Dreadful gear using Mists of Pandaria materials. A full set of gear requires 42 Rouleau d'étoffe d'éolaine (cloth), 11 Peau magnifique (leather/mail) or 93 Barre d'ectofer (plate). Completing either the Dreadful or Malevolent Gladiator's set will grant the achievement for season 12. (8) Some armor pieces from this set drop from Nalak on the Île du Tonnerre. (9) Some armor pieces from this set drop from the Four Celestial World Bosses (Chi Ji, Niuzao, Xuen or Yu’lon) on the Île du Temps figé. Arsenals are available at various vendors for 80 Marque d'honneur each, and include appearances for various PvP weapons. As an example: if you buy Arsenal : armes du gladiateur tyrannique and learn it on a Chaman, you will learn the appearances for all Season 13 weapons, including Arbalète lourde du gladiateur tyrannique (crossbow) even though your Chaman cannot use crossbows. Your Chasseur alt CAN use this appearance now though, since Arsenal : armes du gladiateur tyrannique grants every weapon appearance for the appropriate season to your account-wide transmog collection! The above is the reason that arsenals cost 80 Marque d'honneur each. For example, Equarrisseur de gladiateur and Eventreur de gladiateur have the exact same model, so there is no point in buying both for appearance purposes. Cape d'endurance du gladiateur belliqueux from Malukah Chantelume in Warspear. Copied my Character to the newest Beta, and all Marque d'honneur are in my Inventory. Leedan Gustaf and Ozgrom Ragecroc is selling rank 2 and rank 3 recipies for different professionsin Battle for Azeroth for 2 and 4 marks. As of BfA, I'm finding the "least effort" method of getting these are via the Legion Class Hall. The mission A Good Dust Up awards a Marque d'honneur as bonus (so make sure you 200% it). I have a few alts so doing this every time its up, roughly once a week, provides a sizable amount before you know it, like enough to buy recipes, for example. After you turn in A Good Dust Up you will get a Rapport de bataille, make sure to delete that from your inventory for the mission to show up again (after about a week). Might also want to abandon the auto-accepted associated quest as well just to be safe (Au combat !). "Echangeable contre des armes et des armures historiques auprès des vendeurs JcJ."